The SB100 is a strong XC climbing machine, but the gravity inspired geometry, 120mm Fox 34 Step-Cast fork and meaty tires are all trail. The result is a perfect blend of pedalling efficiency with downhill prowess. Yeti redesigned the Switch Infinity mechanism specifically for 100mm of travel - it's light, and tucks behind the seat tube so we can accommodate a water bottle in the front triangle. Big days require big bottles. Instead of chasing feather weight on the build, Yeti spec'd the bike as they tested it - Fox Transfer post, Maxxis 2.3 tyres, and 180mm front rotor. It's still light, but also right. Our pro rider, Geoff Kabush, will be defending his BC Bike Race title on this rig and it will also be his sled of choice for Downieville and the Breck Epic. 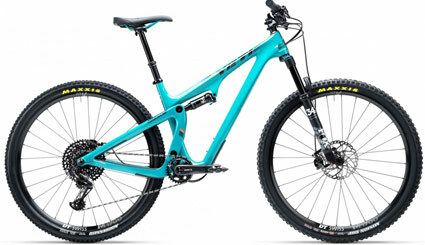 Yeti aimed to strike a balance between durability, weight and price when they spec'd the SB100 TURQ Series X01 Eagle. Like all the other SB100 models we made sure this trail bike was ready to rip with beefy Maxxis tyres and SRAM's new carbon X01 DUB™ crankset system. For all TURQ models, they spec Fox's new Factory Step-Cast 34 fork - lightest in class. Yeti also hung strong Shimano XT brakes on this bike with 180mm front and 160mm rear rotors.